Industrial hemp can be made into everything from super foods to sustainable fibres and grows well in New Zealand conditions. 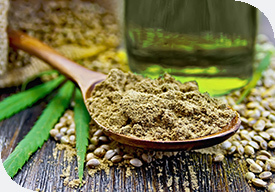 Hemp has applications in many industries, including food and medicine, paper, textiles, plastics and composites, construction, and energy. This wonder crop, restricted for many years, could be a massive local good news story involving Kiwi ingenuity creating products and technology that the burgeoning worldwide industry needs. Governments of both Australia and New Zealand recently approved hemp seed for human consumption. Hemp has huge potential as a health food, with extremely high levels of protein and beneficial fats. Profitable plantings range from market garden size to broad acre arable farms. Returns of $4000 to $8000 per hectare are currently possible – comparable to many other land uses. Hemp is grown in rotation – 90 days for fibre crops and up to 120 days for seed crops. It requires no pesticides, herbicides or fungicides, can phyto-remediate polluted soils and will suppress competing weeds. Hemp grows well all over New Zealand. Flat to rolling land, suitable for a combine harvester, is best. Hemp does not like wet feet, so well-drained, fertile, sandy loam is ideal. Irrigation is not required, although irrigated crops can produce higher yields. How much to invest in planting, harvesting, processing and storage depends on the available local infrastructure. Consider your options carefully before investing in this emerging industry. Industrial hemp contains almost no THC, which is the psychoactive ingredient in marijuana, and is grown under licence. A licence costs $511 and you must also take a one-off THC test, costing about $900, for each variety you grow.